Donald Trump has snapped back at Theresa May on Twitter for her comments about his retweets of a prominent member of Britain First. The US President shared three videos which had originally been posted by the group’s deputy leader Jayda Fransen purporting to show Muslims committing offensive acts. The Prime Minister’s representative said Trump had been wrong to share the posts because Britain First, which is widely viewed as a far-right organisation, created division in society. 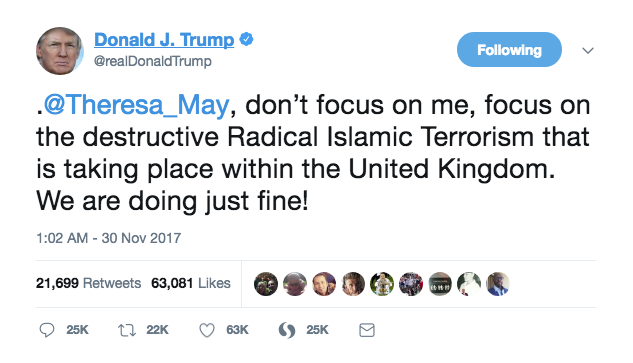 The President told the Prime Minister on Twitter that, instead of worrying about him, she should focus on the “destructive radical Islamic terrorism” happening in the United Kingdom. He made this post twice, after originally posting it to the wrong account. Fransen praised the President for his remark on Twitter in a post just below his own. The White House Press Secretary, Sarah Huckabee Sanders, defended Trump in his decision, saying the President was trying to promote debate about the “real” threat. She would not comment about whether the videos were real.